STORIES: Isabella wrote her first story at Rothschild primary school, on the boundaries of Acton and Chiswick in West London, during the late 1960's. It was called 'Family of Five' and was inspired by Enid Blyton's books. Her first attempt at songwriting was for a high school competition under the direction of Iwo Zaluski, where she sang her lyrics with a felllow pupil. Over the years Isabella has continued to write poetry and verse and has told many made up stories to her five children. In recent years she has been putting pen to paper (or finger to keyboard) with story telling, after her youngest daughter told her 'Mummy you tell the best stories, you should make books'. Certain that E-stories mean that the wood remains in the forest, helping the eco-cycle. Isabella wrote a short story called 'Lucy in the Sky with Diamonds' (a tale about the 'Y-Box') for a proposed anthology with the Brecon Beacons literary group, under the direction of Iwo Zaluski. 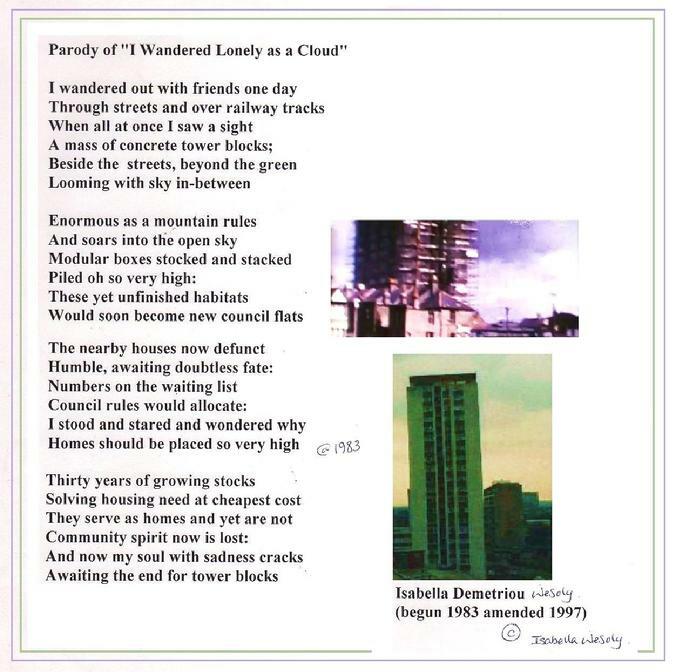 POEMS: In 1986 her first published poem, inspired by life on the 18th floor, led to a mural commission for Isabella (Demetriou). Her idea to run a 'world theme' mural, in the project invitation by Martin Frost (Manager at the Oak Tree Centre) for a Dulux community project. It won first prize in a national competition and is included in the murals on 'MAKING MURALS' button, in the menu, with more murals. A poem, called 'Parody of Wordsworth's Daffodils' written from a feeling that led to an idea, which led a communty mural project that won 1st prize in a national competition.